Instructions: Cut ham into 1/4 inch to 1/2 inch cubes. Remove seeds from jalapenos and slice thinly. 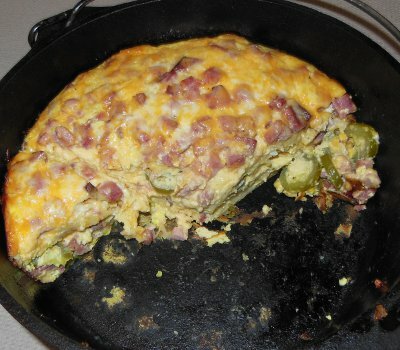 Scatter one jalapeno across bottom of dutch oven. Tear 2 tortillas into 1 inch pieces and scatter over jalapeno slices. Scatter 1 cup of cheese over tortilla pieces. Scatter 1/4 pound of ham over cheese. Create a second layer of chilies, tortillas, cheese, and ham. In a bowl, blend the eggs, milk, and all spices. Pour egg mixture into dutch oven. Put lid on dutch oven and let it sit for 20 to 30 minutes in a cool place. Heat dutch oven to about 350 degrees for Baking and cook for about 45 minutes.